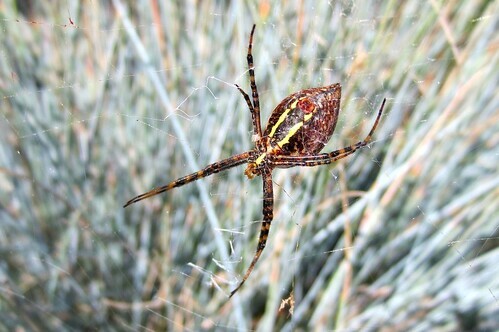 This may be the largest web-building spider in northern United States. The adult female body is ¾″ to 1⅛″ long. The abdomen is egg-shaped and black. 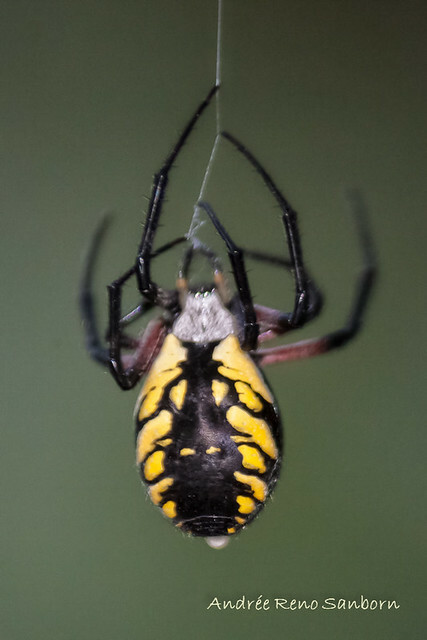 There is a vertical row of bold yellow spots on each side of the abdomen and two or three pairs of yellow spots in the middle. The covering (carapace) of the front segment of the spider’s body (cephalothorax) is densely covered with short, silvery hairs. 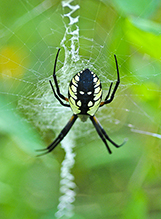 The sternum is black with a yellow vertical stripe. The legs are ¾″ to 2¾″ long. 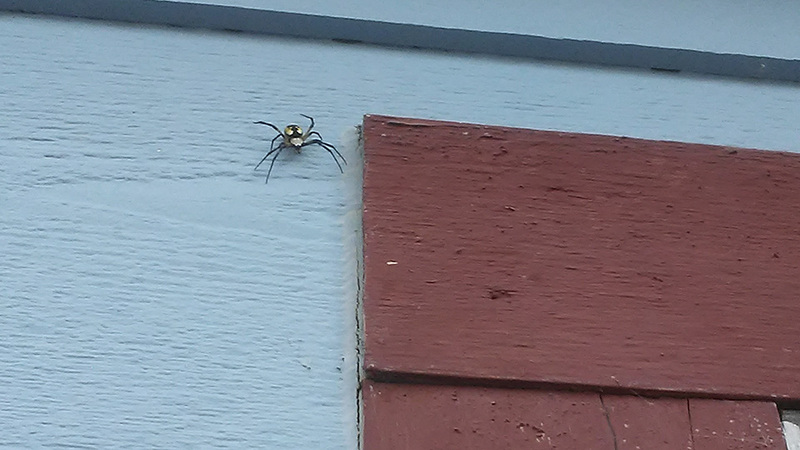 The front legs are black with black femurs. 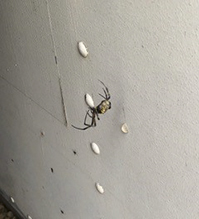 The other legs are black with yellow femurs. 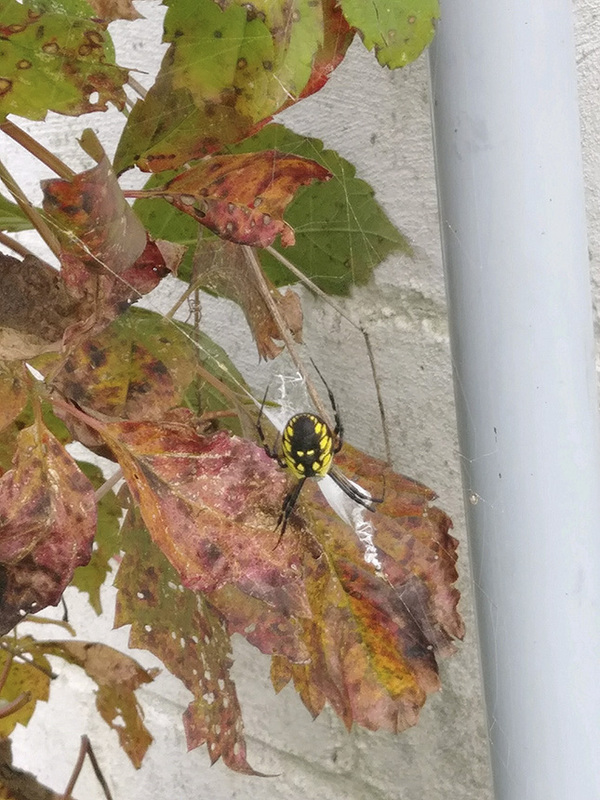 Sometimes there are yellow bands on the legs. There are three claws on each foot. The male is much smaller, ¼″ to ⅜″ long. 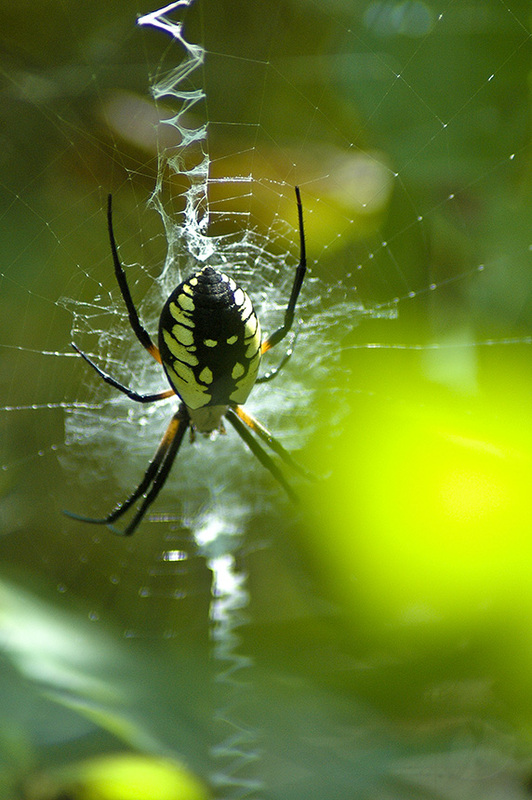 The web is constructed vertically in a sunny location with a nearby retreat. It is flat, circular, and up to 24″ or more in diameter, with 30 to 50 lines (spokes) radiating from the center. It is decorated with a pair conspicuous, zigzag, vertical lines (stabilimenta), one above and one below the center. The stabilimenta are made of multiple threads of non-sticky silk. The purpose of the stabilimenta is a matter of debate. Some think that because they are highly reflective of ultraviolet light their purpose is to attract insects. 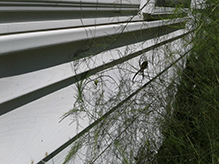 Others believe that their purpose is to prevent damage to the web by making it visible to low flying birds. A study in 1998 supports the latter position. 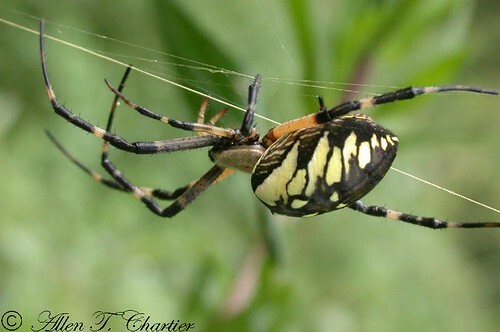 After mating, the female produces usually 1 to 3, rarely 4, egg sacs and attaches them to her web. 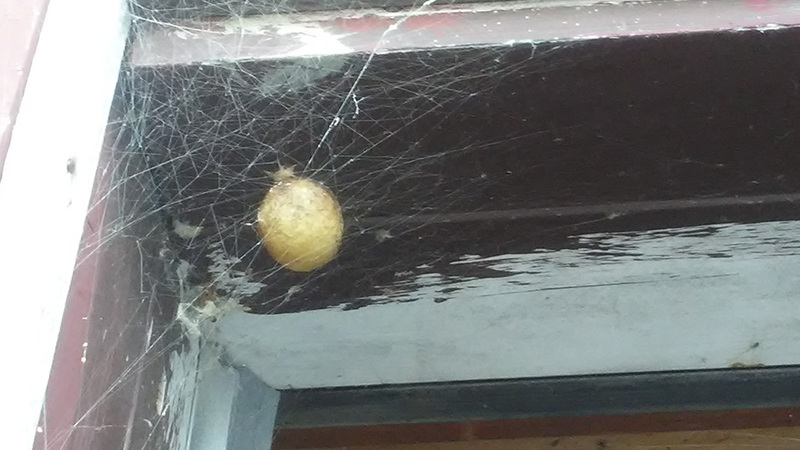 Each egg sac is round, papery, up to 1″ in diameter, and contains 300 to 1,400 eggs. The eggs hatch in late summer or fall. The hatchlings overwinter in the egg sac, not leaving it until the spring of the following year. Adults die in the first frost of the fall, having lived just over one year. Adults are active day and night. 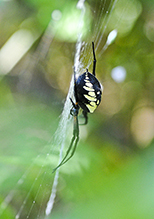 The female sits head down in the center of her web, or concealed nearby in a rolled leaf, waiting for prey to be caught in the web. On spiders, the hard, upper, shell-like covering of the cephalothorax. 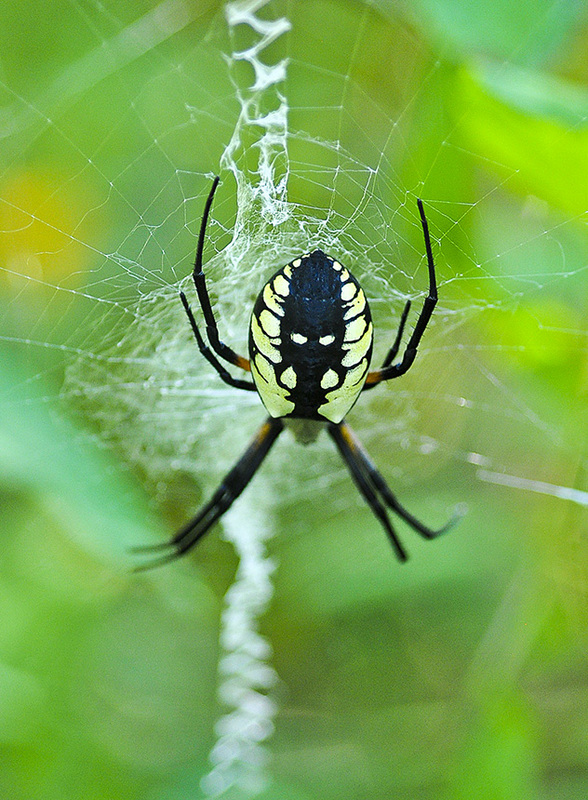 A decoration of the web of certain orb spiders; thought to attract prey and conceal the spider. 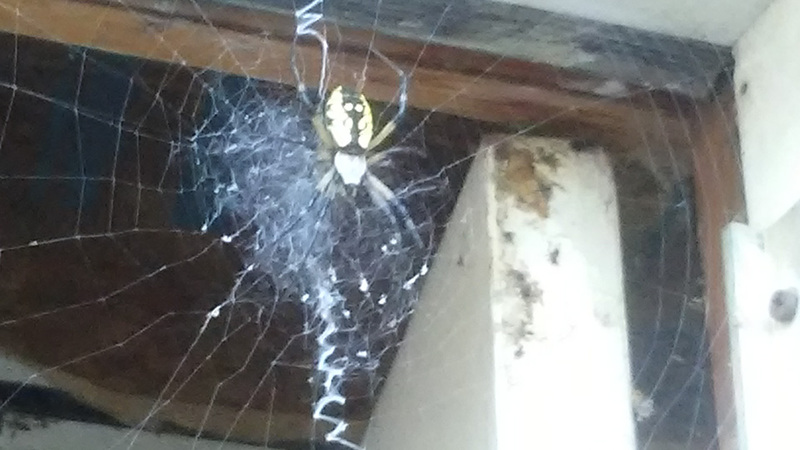 Found on the deck by our front door. 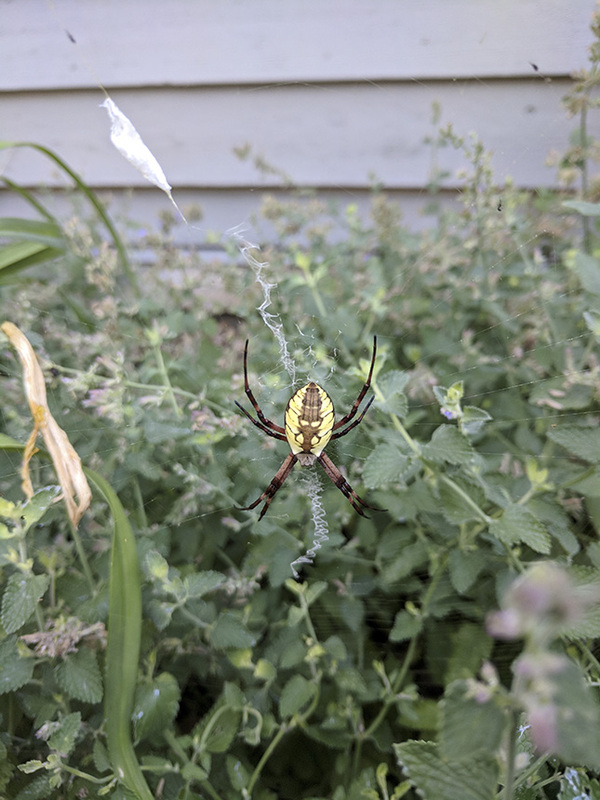 Had a large web in the shrub. A quick and up close look at a common, colorful spider known by several names such as Black and Yellow Garden spider, Golden Orbweaver, zig zag spider and several other names. About an inch in body length - legs not included. Add on the long legs and it can appear to be quite large overall. 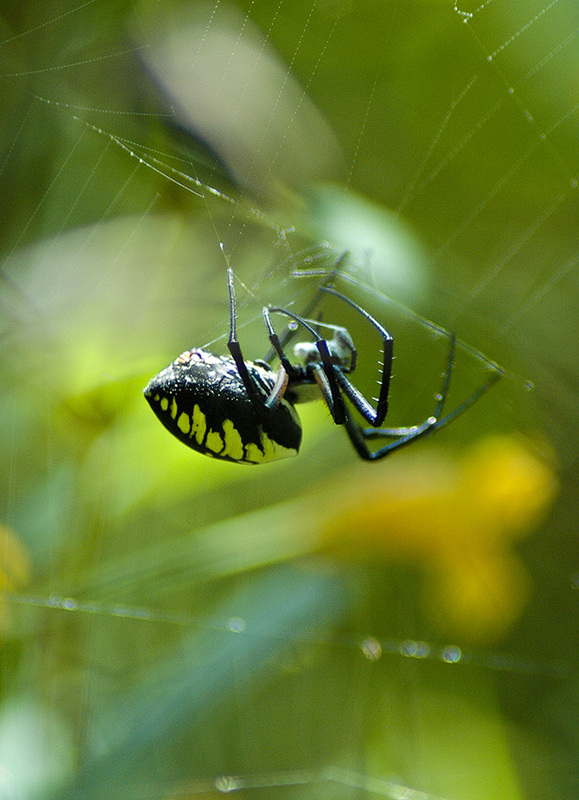 They typically build their webs in gardens, tall grassy areas etc. where they catch and seem to guard their food (insects). 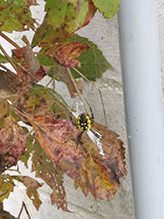 There is written text on this particular spider and what I have come to know about it at the beginning of the video so I will not go into any more detail here. Hope you enjoy it. 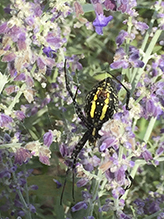 This is probably the best video I have concerning the Black and Yellow Argiope Spider. 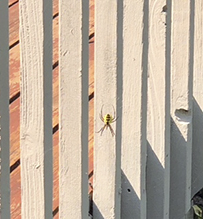 The largest garden spider of the northern United States vs. one of the largest wasps in the world. 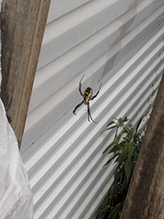 This cicada killer was considerabaly alot larger than the Black and Yellow Argiope Spider, and I have never seen anything like this! Please Enjoy, and Happy Thanksgiving! Best to watch in High qaulity!!! -From 2:55-end of video, blurriness is GONE!! -From 4:40-4:53, you can see the spider biting the wasp with her fangs (better if watched in high qaulity). I will continue posting more wildlife videos. Please feel free to subscribe! She probably won't live much longer - these Argiopes supposedly live only a year and die during the winter - and it's already getting cold here. 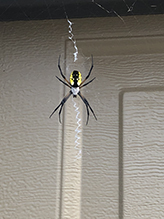 This is about three hours after the argiope spider was persistently working on the egg sack, shown in the last video I posted. She is still working on the protective covering of that egg sack. Please subscribe, and thanks for watching! 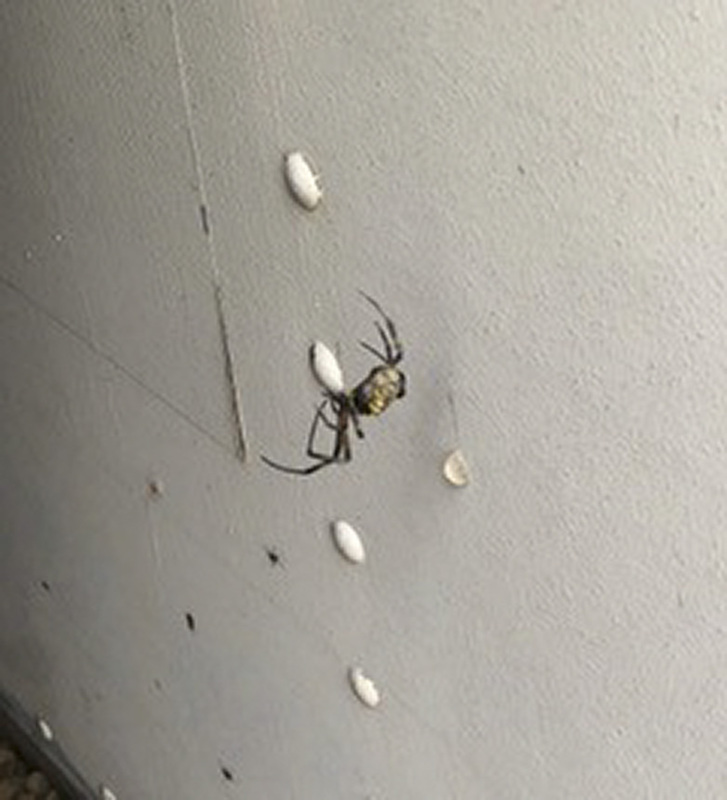 I found these two spiders in my doorway yesterday. I looked them up and the map shows that Cottonwood county is not marked as having them. Are they rare here? 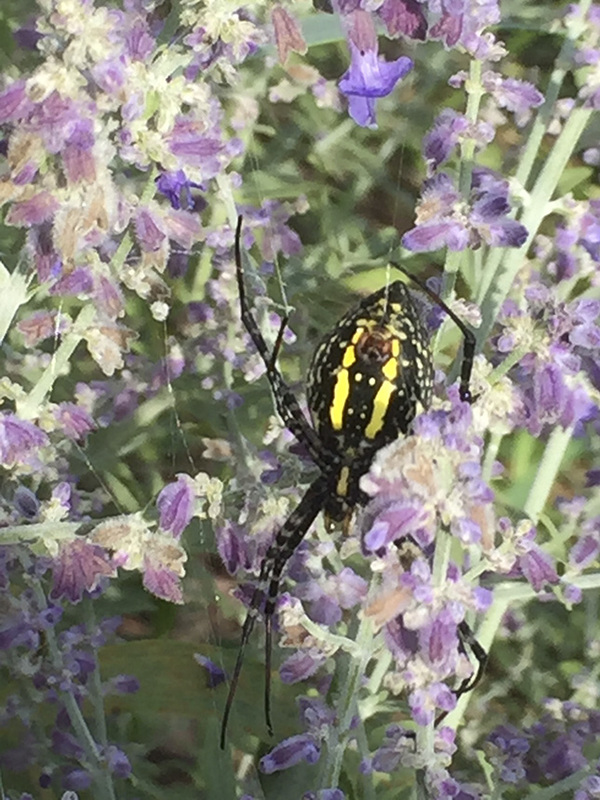 Black and yellow argiope have been reported in two neighboring counties, so it is not surprising that they are found in Cottonwood County as well. Cottonwood County is now included on the distribution map. Has a web in one of our shrubs. 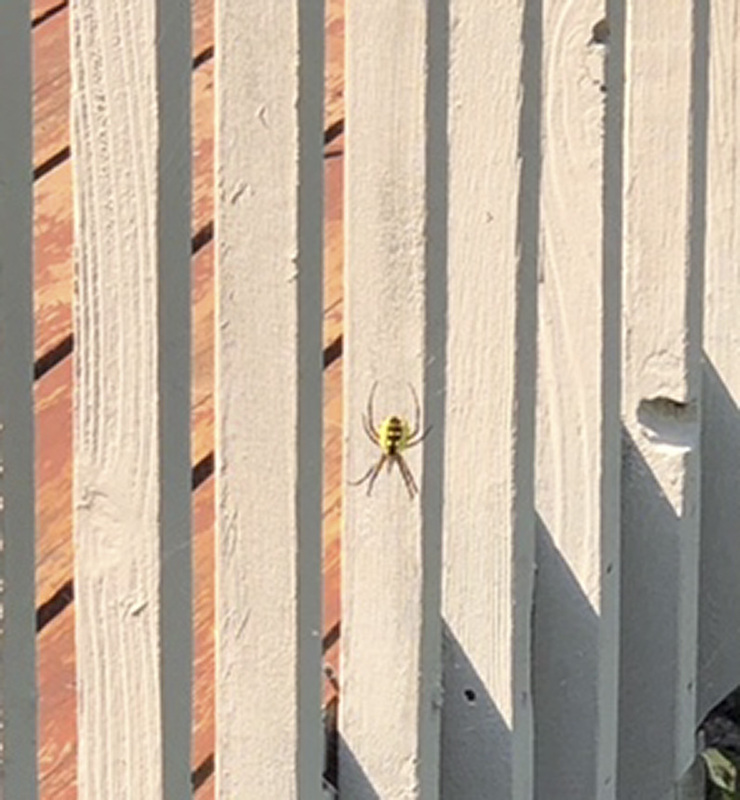 I was doing some deadheading of plants in my garden, I looked up and there it was twelve inches from my face. 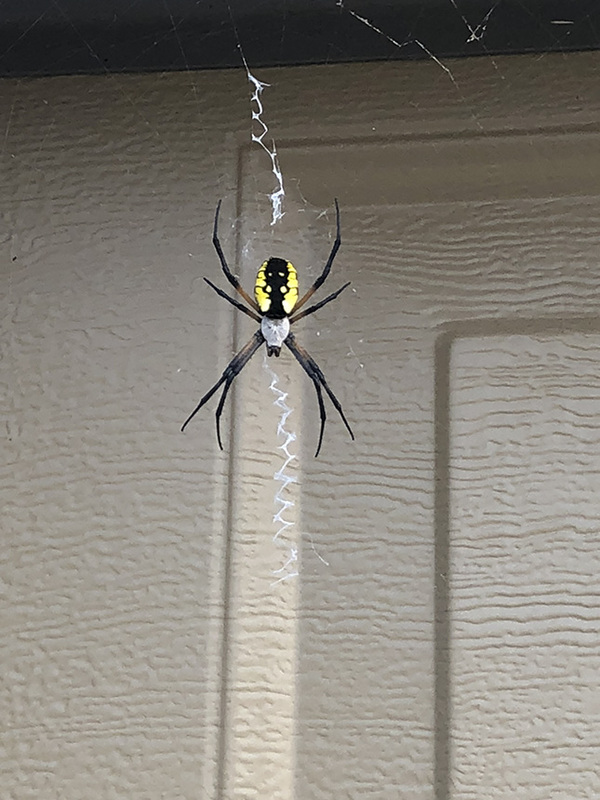 Beautiful and a little startling, I had never seen one before.